Have you ever wondered what Capricorns are for ? Slowly plodding their way up their own personal mountain path, really not that interested in the comings and goings of life down in the valley. Some signs it must be said get a bad press, Capricorns seldom get any press at all because everyone thinks they’re far too boring and serious and are happy to let them get on with their obsessively narrow pursuits. They are often depicted as being materialistic, but this does not really do them justice. They are probably the most emotionally stable of all signs, although some would say that’s down to their lack of sensitivity. They are also used to living with austerity, so money itself does not generally tick their box. Why are they like this and what are they trying to achieve anyway ? The best way to understand them is to think about what’s happening in nature when the Sun goes through the sign. Capricorn begins at the winter solstice on the shortest day when the hours of light are at their weakest. Its dark and cold and its as if the whole of life is just engaged in the simple struggle of surviving through the winter. This is why the sign is so serious. Capricorns always have some kind of mission that they are on. It is based on the idea that they have to take this very small light of life that has almost been extinguished and carry it through as the hours of daylight slowly increase. The reward for their labours is a long way off, in the spring and summer, but this does not deter them. They do not seek instant, or even any kind of gratification, they even expect the praise and recognition to go to someone else. The only important thing is that they stay on the path. The are extremely pragmatic, everything is seen in terms of whether it will assist them on their way up the mountain, if it does they will use it, if not they will discard it. They are depicted as being conventional but are often attracted to very unusual pursuits or ideas, its just that they pursue them in a very conventional manner. Through many years of attending astrology lectures, Capricorn Research has always been struck by the number of others there that share the same sign. In a collection of charts of 953 astrologers Mercury scores highest in Capricorn. Capricorns are definitely attracted to astrology, but only because it works. The sign has a very step by step, structured mentality. They are obsessed with order, not necessarily with detail, that is more of a Virgo trait, their role is to make something lasting and permanent, to literally create order out of chaos. One mountain goat who strove to this end was the German mathematician, astronomer, and astrologer, Johannes Kepler. Kepler is best known for being the first person to correctly explain planetary motion as verifiable and precise and as a result became the founder of celestial mechanics. Capricorn Research’s collection of 737 charts of Scientists show the most common Sun signs to be Capricorn and Gemini, both scoring 138% of the expected figure. 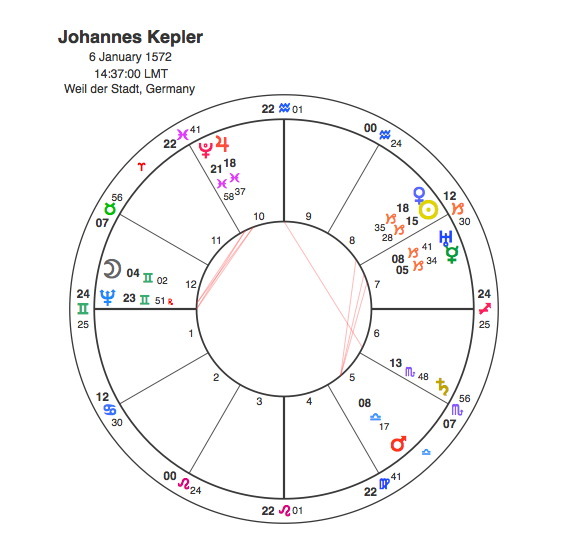 Johannes Kepler was essentially a combination of these two signs with 4 planets in Capricorn including the Sun and with the Moon, Neptune and Ascendant in Gemini. Included in Kepler’s Capricorn group was a Mercury / Uranus conjunction that would best describe a scientific genius. In Kepler’s time there was no real differentiation between astronomers and astrologers and even ultimately with religion, in fact the main reason for studying the skies was to gain greater insight into God’s plan for his creatures on Earth. That Kepler was a both a scientific genius and a mystic is shown by his exact conjunction of Neptune with his Ascendant. He incorporated religious arguments and reasoning into his work, motivated by the conviction that God had created the world according to an intelligible plan that is accessible through reason. Kepler believed more intensely than his contemporaries in the power of mathematics to expose the order in the universe that lay behind apparent complication, and he applied this criterion of simplicity with great effect in his astronomy. His achievements were many and profound. In his work with optics, he was first to investigate the formation of pictures with a pin hole camera. He was also the first to explain the use of both eyes for depth perception and the process of vision by refraction within the eye. He was therefore also the first person to formulate eyeglass designing for nearsightedness and farsightedness. He was also the first to explain the principles of how a telescope works, to describe real, virtual, upright and inverted images and magnification and the properties of total internal reflection. He was the first to explain that the tides are caused by the Moon despite the disapproval of Galileo. He was the first to suggest that the Sun rotates about its axis and also coined the word “satellite”. He was the first to derive the birth year of Christ. He also tried to use stellar parallax caused by the Earth’s orbit to measure the distance to the stars in an early version astrometry. He was the first to derive logarithms purely based on mathematics and his work formed the basis of integral calculus. But more important than all of these, he brought up to date and proved an ancient principle of sacred geometry. He focused on the five Platonic solids, their harmonic ratios, and how these shapes correlated with planetary orbits and sound frequencies. Kepler saw Geometry as existing upon an archetypal level, prior to the manifestation of material creation. Through the study and practice of Sacred Geometry this invisible geometric matrix begins to reveal itself as the template upon which the material universe, expressed through space and time, has been framed by the hand of the Great Architect. He used the sacred geometry of the five Platonic solids to calculate the distances between the orbits of the planets and found that each of these solids could be uniquely inscribed and circumscribed by spherical orbs. Nesting these solids, each encased in a sphere, within one another would produce six layers, corresponding to the six known planets—Mercury, Venus, Earth, Mars, Jupiter, and Saturn. By ordering the solids correctly—octahedron, icosahedron, dodecahedron, tetrahedron, cube—Kepler found that the spheres could be placed at intervals corresponding to the relative sizes of each planet’s path. Kepler also found a formula relating the size of each planet’s orb to the length of its orbital period, from inner to outer planets, the ratio of increase in orbital period is twice the difference in orb radius. In his first law Kepler showed that a planet moves in an elliptical orbit that has the Sun as one of its two foci. His second law showed that a line joining a planet to the Sun sweeps out equal areas in equal times, as the planet charts its orbit. Kepler worked out that there is just one magic number that gave the answer to both orbit size and timing. His third law states that the ratio of the square of a planet’s orbital time is proportional to the cube of its mean distance from the Sun. It was this law, not an apple, that led Newton to his law of gravity. Amazingly even the outer planets that were discovered long after Kepler’s death, vary only by a maximum of 0.24 per cent ( Pluto ) from this median value. This is confirmation that the laws of the Universe are reducible to simple geometry ( the ellipse ) and simple arithmetic ( Kepler’s constant ). Many of Kepler’s insights came to him in an epiphany in July 1595, while demonstrating the periodic conjunction of Saturn and Jupiter in the zodiac, he realized that regular polygons bound one inscribed and one circumscribed circle at definite ratios, which, he reasoned, might be the geometrical basis of the universe. That this was the turning point in his life was clear as it coincided with Pluto’s only transit to his Sun, the square between 1593 and 95. In July 1595, both Uranus and Mars arrived in the same place. In finding the music of the cosmos, Kepler showed that life forms on Earth follow the same harmonic principles as those found in the stars. Capricorn Research would love to start a study group for Lutheran astrologers, but is currently too busy plodding up this mountain.